Zileuton has the molecular formula C11H12N2O2S and a molecular weight of 236.29. It is a racemic mixture (50:50) of R(+) and S(-) enantiomers. Zileuton is a practically odorless, white, crystalline powder that is soluble in methanol and ethanol, slightly soluble in acetonitrile, and practically insoluble in water and hexane. The melting point ranges from 144.2ËšC to 145.2ËšC. ZYFLO tablets for oral administration are supplied in one dosage strength containing 600 mg of zileuton. Zileuton is rapidly absorbed upon oral administration with a mean time to peak plasma concentration (Tmax) of 1.7 hours and a mean peak level (Cmax) of 4.98 Î¼g/mL. The absolute bioavailability of ZYFLO is unknown. Systemic exposure (mean AUC) following 600 mg ZYFLO administration is 19.2 Î¼g.hr/mL. Plasma concentrations of zileuton are proportional to dose, and steady-state levels are predictable from single-dose pharmacokinetic data. Administration of ZYFLO with food resulted in a small but statistically significant increase (27%) in zileuton Cmax without significant changes in the extent of absorption (AUC) or Tmax. Therefore, ZYFLO can be administered with or without food (see DOSAGE AND ADMINISTRATION). The apparent volume of distribution (V/F) of zileuton is approximately 1.2 L/kg. Zileuton is 93% bound to plasma proteins, primarily to albumin, with minor binding to Î±l-acid glycoprotein. Effect of age: The pharmacokinetics of zileuton were investigated in healthy elderly volunteers (ages 65 to 81 years, 9 males, 9 females) and healthy young volunteers (ages 20 to 40 years, 5 males and 4 females) after single and multiple oral doses of 600 mg every 6 hours of zileuton. Zileuton pharmacokinetics were similar in healthy elderly subjects (â‰¥65 years) compared to healthy younger adults (18 to 40 years). Effect of gender: Across several studies, no significant gender effects were observed on the pharmacokinetics of zileuton. Renal insufficiency: The pharmacokinetics of zileuton were similar in healthy subjects and in subjects with mild, moderate, and severe renal insufficiency. In subjects with renal failure requiring hemodialysis, zileuton pharmacokinetics were not altered by hemodialysis and a very small percentage of the administered zileuton dose (<0.5%) was removed by hemodialysis. Hence, dosing adjustment in patients with renal dysfunction or undergoing hemodialysis is not necessary. Hepatic insufficiency: ZYFLO is contraindicated in patients with active liver disease (see CONTRAINDICATIONS and PRECAUTIONS, Hepatic). Active liver disease or transaminase elevations greater than or equal to three times the upper limit of normal (â‰¥3xULN) (see PRECAUTIONS, Hepatic). 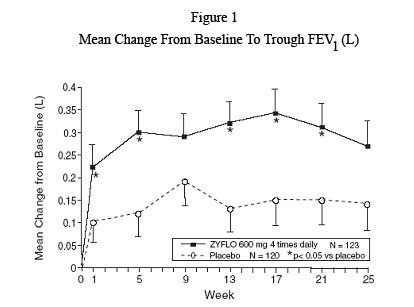 Elevations of one or more liver function tests may occur during ZYFLO therapy. These laboratory abnormalities may progress, remain unchanged, or resolve with continued therapy. In a few cases, initial transaminase elevations were first noted after discontinuing treatment, usually within 2 weeks. The ALT (SGPT) test is considered the most sensitive indicator of liver injury. In placebo-controlled clinical trials, the frequency of ALT elevations greater than or equal to three times the upper limit of normal (3xULN) was 1.9% for ZYFLO-treated patients, compared with 0.2% for placebo-treated patients. In a long-term safety surveillance study, 2458 patients received ZYFLO in addition to their usual asthma care and 489 received their usual asthma care. In patients treated for up to 12 months with ZYFLO in addition to their usual asthma care, 4.6% developed an ALT of at least 3xULN, compared with 1.1% of patients receiving only their usual asthma care. Sixty-one percent of these elevations occurred during the first two months of ZYFLO therapy. After two months of treatment, the rate of new ALT elevations â‰¥3xULN stabilized at a mean of 0.30% per month for patients receiving ZYFLO-plus-usual-asthma care compared with 0.11% per month for patients receiving usual asthma care alone. Of the 61 ZYFLO plus-usual-asthma-care patients with ALT elevations between 3 to 5xULN, 32 patients (52%) had ALT values decrease to below 2xULN while continuing ZYFLO therapy. Twenty-one of the 61 patients (34%) had further increases in ALT levels to â‰¥5xULN and were withdrawn from the study in accordance with the study protocol. 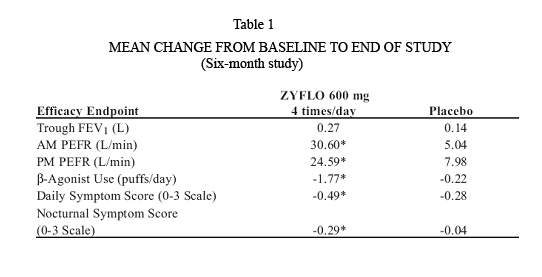 In patients who discontinued ZYFLO, elevated ALT levels returned to <2xULN in an average of 32 days (range 1-111 days). In controlled and uncontrolled clinical trials involving more than 5000 patients treated with ZYFLO, the overall rate of ALT elevation â‰¥3xULN was 3.2%. In these trials, one patient developed symptomatic hepatitis with jaundice, which resolved upon discontinuation of therapy. An additional 3 patients with transaminase elevations developed mild hyperbilirubinemia that was less than three times the upper limit of normal. There was no evidence of hypersensitivity or other alternative etiologies for these findings. In subset analyses, females over the age of 65 appeared to be at an increased risk for ALT elevations. Patients with pre-existing transaminase elevations may also be at an increased risk for ALT elevations (see CONTRAINDICATIONS). It is recommended that hepatic transaminases be evaluated at initiation of, and during therapy with, ZYFLO. Serum ALT should be monitored before treatment begins, once-a-month for the first 3 months, every two to three months for the remainder of the first year, and periodically thereafter for patients receiving long-term ZYFLO therapy. If clinical signs and/or symptoms of liver dysfunction (e.g., right upper quadrant pain, nausea, fatigue, lethargy, pruritus, jaundice, or â€œflu-likeâ€ symptoms) develop or transaminase elevations greater than 5 times the ULN occur, ZYFLO should be discontinued and transaminase levels followed until normal. Neuropsychiatric events have been reported in adult and adolescent patients taking zileuton, the active ingredient in ZYFLO and zileuton extended-release tablets. Post-marketing reports with zileuton include sleep disorders and behavior changes. The clinical details of some post-marketing reports involving ZYFLO appear consistent with a drug-induced effect. Patients and prescribers should be alert for neuropsychiatric events. Patients should be instructed to notify their prescriber if these changes occur. Prescribers should carefully evaluate the risks and benefits of continuing treatment with ZYFLO if such events occur (see ADVERSE REACTIONS, Post-marketing Experience). If they experience signs and/or symptoms of liver dysfunction (e.g., right upper quadrant pain, nausea, fatigue, lethargy, pruritus, jaundice, or â€œflu-likeâ€ symptoms), they should contact their physician immediately. Patients should be instructed to notify their healthcare provider if neuropsychiatric events occur while using ZYFLO. Co-administration of ZYFLO and propranolol results in a significant increase in propranolol concentrations. Administration of a single 80-mg dose of propranolol in 16 healthy male volunteers who received ZYFLO 600 mg every 6 hours for 5 days resulted in a 42% decrease in propranolol clearance. This resulted in an increase in propranolol Cmax, AUC, and elimination half-life by 52%, 104%, and 25%, respectively. There was an increase in Î²-blockade and decrease in heart rate associated with the co-administration of these drugs. Patients on ZYFLO and propranolol should be closely monitored and the dose of propranolol reduced as necessary (see WARNINGS). No formal drug-drug interaction studies between ZYFLO and other beta-adrenergic blocking agents (i.e., Î²-blockers) have been conducted. It is reasonable to employ appropriate clinical monitoring when these drugs are co-administered with ZYFLO. Pregnancy: Pregnancy Category C: Developmental studies indicated adverse effects (reduced body weight and increased skeletal variations) in rats at an oral dose of 300 mg/kg/day (providing approximately 18 times the systemic exposure [AUC] achieved at the maximum recommended human daily oral dose). Comparative systemic exposure [AUC] is based on measurements in nonpregnant female rats at a similar dosage. Zileuton and/or its metabolites cross the placental barrier of rats. Three of 118 (2.5%) rabbit fetuses had cleft palates at an oral dose of 150 mg/kg/day (equivalent to the maximum recommended human daily oral dose on a mg/m2 basis). There are no adequate and well-controlled studies in pregnant women. ZYFLO should be used during pregnancy only if the potential benefit justifies the potential risk to the fetus. Nursing Mothers: Zileuton and/or its metabolites are excreted in rat milk. It is not known if zileuton is excreted in human milk. Because many drugs are excreted in human milk, and because of the potential for tumorigenicity shown for ZYFLO in animal studies, a decision should be made whether to discontinue nursing or to discontinue the drug, taking into account the importance of the drug to the mother. Pediatric Use: The safety and effectiveness of ZYFLO in pediatric patients under 12 years of age have not been established. Due to the risk of hepatoxicity, use of ZYFLO in pediatric patients under 12 years of age is not recommended. Geriatric Use: In subset analyses, females over the age of 65 appeared to be at an increased risk for ALT elevations. Zileuton pharmacokinetics were similar in healthy elderly subjects (â‰¥65 years) compared to healthy younger adults (18 to 40 years) (see PHARMACOKINETICS-- Special populations: Effect of age). 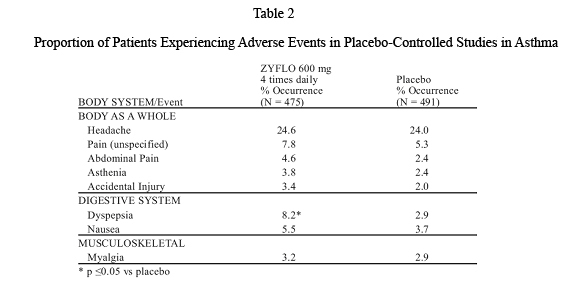 Adverse events most frequently occurring (frequency â‰¥3%) in ZYFLO-treated patients and at a frequency greater than placebo-treated patients are summarized in Table 2. In placebo-controlled clinical trials, the frequency of ALT elevations â‰¥3xULN was 1.9% for ZYFLO-treated patients, compared with 0.2% for placebo-treated patients. In controlled and uncontrolled trials, one patient developed symptomatic hepatitis with jaundice, which resolved upon discontinuation of therapy. An additional 3 patients with transaminase elevations developed mild hyperbilirubinemia that was less than three times the upper limit of normal. There was no evidence of hypersensitivity or other alternative etiologies for these findings. ZYFLO is contraindicated in patients with active liver disease or transaminase elevations greater than or equal to 3xULN (see CONTRAINDICATIONS). It is recommended that hepatic transaminases be evaluated at initiation of and during therapy with ZYFLO (see PRECAUTIONS, Hepatic). Occurrences of low white blood cell count (â‰¤2.8 x 109/L) were observed in 1.0% of 1,678 patients taking ZYFLO and 0.6% of 1,056 patients taking placebo in placebo-controlled studies. These findings were transient and the majority of cases returned toward normal or baseline with continued ZYFLO dosing. All remaining cases returned toward normal or baseline after discontinuation of ZYFLO. Similar findings were also noted in a long-term safety surveillance study of 2458 patients treated with ZYFLO plus usual asthma care versus 489 patients treated only with usual asthma care for up to one year. The clinical significance of these observations is not known. Post-Marketing Experience: Cases of sleep disorders and behavior changes have been reported (see PRECAUTIONS, Neuropsychiatric Events). Rash and urticaria have been also reported with ZYFLO. ZYFLO Tablets are available as 1 dosage strength: 600-mg white to off white, ovaloid, film coated tablets debossed â€œCT 1â€ on one side and bisect on the other side. Recommended storage: Store tablets at controlled room temperature between 20Ëš-25ËšC, (68Ëš-77ËšF). See USP. Protect from light. This leaflet provides important information about taking ZYFLO. It is not meant to take the place of your doctorâ€™s specific instructions. Talk to your doctor if you have any questions about ZYFLO. Your doctor or pharmacist can also provide you with additional information about ZYFLO. The most important things to remember are to take all your doses of ZYFLO every day and to make sure that you return to your doctorâ€™s office for scheduled liver enzyme tests. You should also know that you should seek medical help immediately if you need more â€œpuffsâ€ of your bronchodilator inhaler than normal or if you use the maximum number of â€œpuffsâ€ prescribed for one 24-hour period. These could be a sign of worsening asthma which means that your asthma therapy may need to be changed. For ZYFLO to help control your asthma symptoms, it must be taken everyday as prescribed by your doctor. ZYFLO WILL NOT relieve an asthma attack that has already started. While taking ZYFLO, it is important to keep taking your other asthma medicines as directed and to follow all of your doctorâ€™s instructions. One side effect that occurs in a small number of patients is an increased release of substances from the liver called â€œenzymes.â€ Liver enzymes can be measured by a simple blood test. It is important that your doctor makes sure that your liver enzymes do not become too high and that it is safe for you to continue taking ZYFLO. To insure your safety, your doctor will do this blood test before you first start taking ZYFLO and repeat it on a regular basis while you are taking the medicine. Usually, even if your liver enzymes are increased, you will not notice any symptoms. However, some symptoms of increased liver enzymes are feeling more tired than normal, â€œflu-likeâ€ symptoms, itching, yellow skin, and/or yellow color in the whites of the eyes, or urine that is darker than normal. Sleep problems and changes in your behavior can happen while you take ZYFLO. Tell your healthcare provider if you have any sleep problems or changes in behavior. Where should I keep my supply of ZYLFO? Protect ZYFLO from light and replace the child-resistant cap each time after use. Store ZYFLO between 68â—¦ - 77â—¦ F (20â—¦ - 25â—¦C).